We brought the kayaks down from their storage place, where they hang all winter upside down under a second-story balcony. Before we could load them up in the truck, we had to remove the very large nest taking up residence in one of them. I felt badly about that, but we have some robins that set up shop in some very strange places around our house. 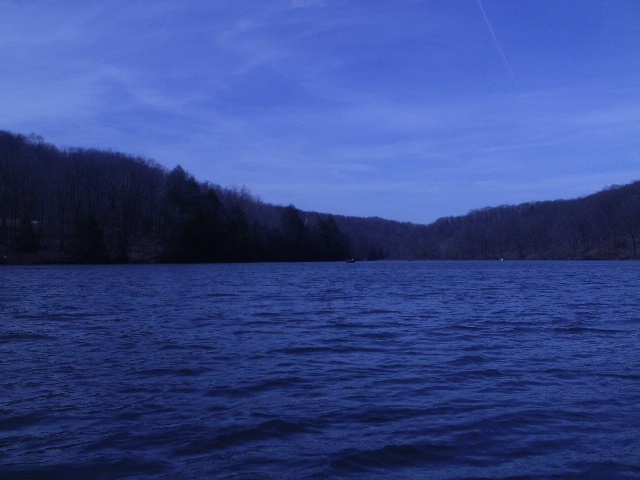 We live about twenty minutes from Raccoon Creek State Park, but for some reason we’ve spent very little time there. We’ve never been on Raccoon Lake which is created from the water dammed on Traverse Creek. Raccoon Creek doesn’t even touch the lake but travels on the outskirts of the park. 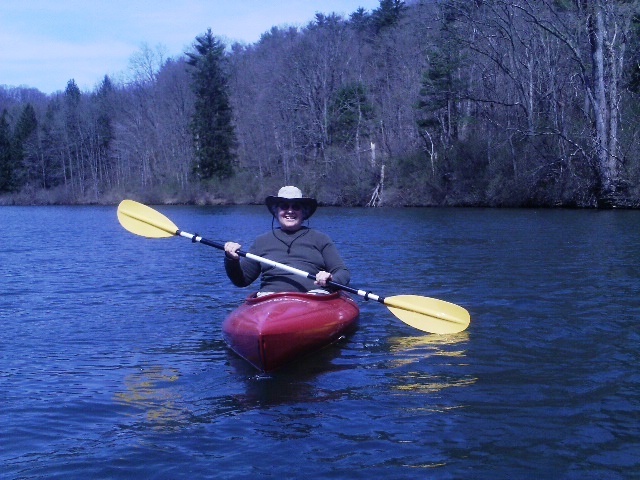 We had an adventure on Raccoon Creek several years ago when our kayaks capsized after ramming into a large tree downed over the creek where it runs its fastest. The cruise on Raccoon Lake this past weekend didn’t bring any adventures, except when my kayak banged up against what I thought was a rock as we approached the end of the lake and shallow, muddy water. Sure enough, the red, green and brown shell looked ancient and massive–two feet long at least. 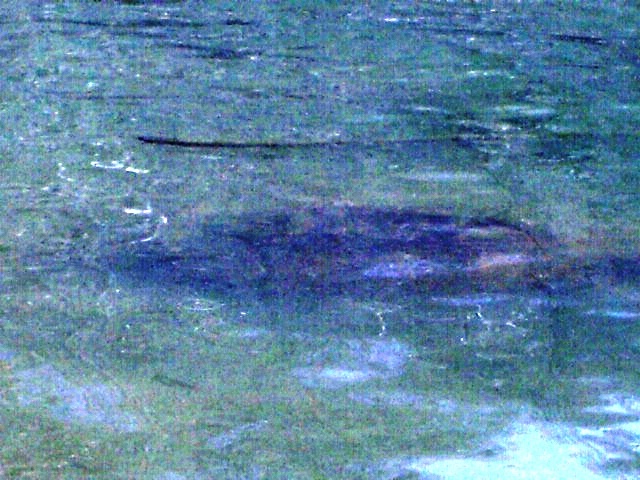 I didn’t have my good camera, so this is all I could manage to shoot of the creature in Raccoon Lake. It’s an outline at best. 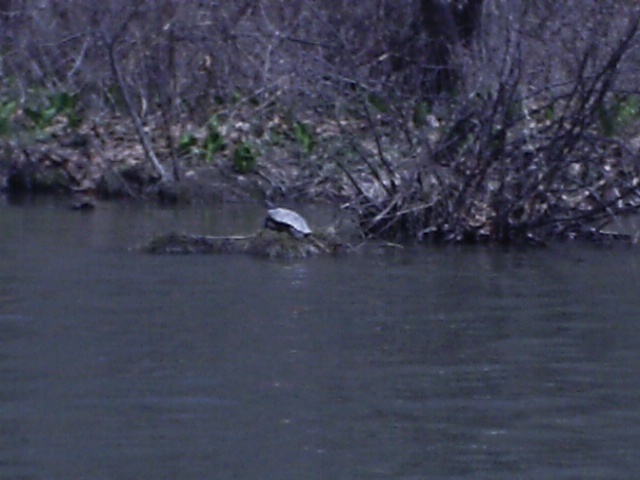 I’m guessing it’s a snapping turtle because I couldn’t really get a clear view either with my naked eye or through my camera lens. When my kayak nudged him, I worried it might wake the sleeping giant, but it just swam away from me leaving me intact in the kayak. We also saw an osprey guarding its nest. I will never again leave my good camera with zoom lens at home for even the shortest of nature explorations. My little pocket camera couldn’t zoom far enough to capture the osprey standing on a branch high above the banks. I didn’t even try to pull the camera out of the ziplock baggie. In a way, there was relief in not worrying about capturing the moment. I could just enjoy the majesty of this bird and rejoice in its population resurgence in western Pennsylvania. The warm spring day makes me yearn for more lovely days when the trees are green and flowers bloom along the shore. We plan to spend more time in this lovely spot in our backyard. After all, the day we found our house four years ago, we were on our way to the Wildflower Preserve within the park. 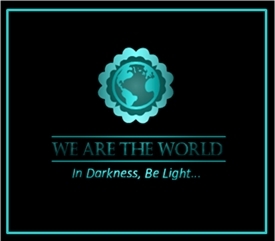 I haven’t been back since 2010, but this is the year to explore nearer to home. BP’s oil spill in 2010 still haunts us today as scientists study the lingering effects of the millions of barrels of oil that gushed into the Gulf of Mexico. At the time of the spill, I worked for the Florida Fish and Wildlife Conservation Commission as a public relations director. Immediately, our agency became watchdogs for oil headed toward Florida’s waters and beaches. I wrote about the oil spill in my novel, Trails in the Sand, using it as the backdrop for a family racing to save itself from destruction. 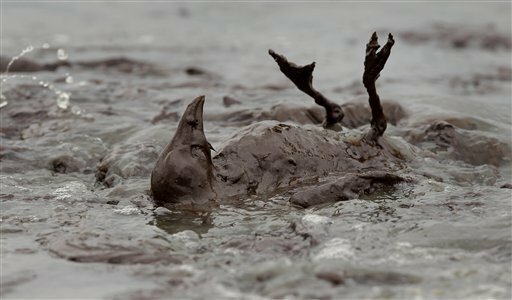 April 20, 2014 represents the forty-fourth anniversary of the first Earth Day, and it’s also sadly, the fourth anniversary of BP’s Deepwater Horizon oil spill disaster. Here’s to remembering the past lest we repeat our same mistakes. It’s been 153 years since the first shot of the Civil War was fired on April 12, 1861. Here’s the take of the weeks leading up to it and the aftermath from the viewpoint of a Union soldier, my great grandfather, Harmon Camburn. This is an excerpt from his memoir, Civil War Journal of a Union Soldier. It had been my intention to continue working summers and teaching winters, and with the money so earned to work my way through college. But the political ferment that had been so long brewing between the North and South began to assume proportions that boded trouble to the nation. The threat of the Southerners to dissolve the Union was being discussed all over the country. Rumors of troops being raised to resist the government began to reach us. The excitement was growing so intense that little else was talked of in the family circle, on the streets, or in public gatherings. Resistance to southern outrages was even preached from the pulpit. While watching the course of events with absorbing interest, I had made up my mind to embrace the first opportunity, should there be any call, to enlist to help put down the coming rebellion, which no one thought would be more than a summer campaign. Notwithstanding the boasts and threats of the South, the firing on Fort Sumter fell like a thunderbolt on the people. Immediately, the whole North began to organize military companies; and war meetings were held everywhere. Then came the call of President Lincoln for seventy-five thousand men for three months. Michigan was asked for one regiment of ten companies under this call. Two companies were started in Adrian: the Hardee Cadets and the Adrian Guards. The Guards being the oldest company, I thought they would be the first accepted; and consequently chose that company, thinking that perhaps that would be the last chance I would ever have to serve my country as a soldier. On our arrival at Adrian, Father left me at liberty while he transacted some necessary business, and I made my way directly to the recruiting office of the Adrian Guards where I signed a pledge to enlist in the company for three months. I soon met Father and told him what I had done. After presenting all the arguments at his command to dissuade me from going into the army, and finding me still resolute, he said, “Go and do your duty, and if I was as young and strong as you, I would go, too.” When my father had gone home, I returned to the recruiting officer and signified my readiness to begin the life of a soldier at once. Being required to write my age upon the enlistment paper, I wrote “nineteen years.” The recruiting officer sarcastically remarked, “Yes, three years ago.” And when I assured him of the truthfulness of my statement, he laughed immoderately. My great grandfather served for the next three years until he was shot and captured in the Battle of Knoxville in late 1863. It’s been a slow start here in western Pennsylvania after a tough winter. My husband has been preparing the soil and raised beds for a few weeks. The seedlings are growing under grow lights. He puts the trays outside each day for a few hours of sun, if possible. This weekend, he finally put the peas in the ground. And spinach seedlings will be put in the raised bed next to the peas later this afternoon. Two years ago we put in raspberry plants and asparagus. 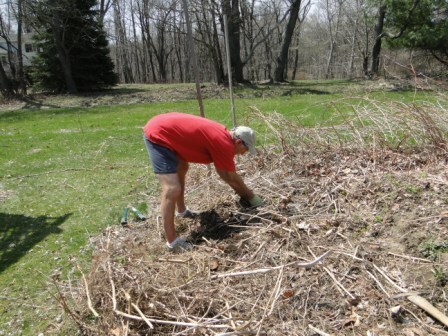 My husband spent a few hours this weekend pulling the raspberry roots that invaded the asparagus bed. So far, we can’t see any asparagus coming up. Let’s hope the raspberries didn’t invade too far. We didn’t realized how invasive raspberries can be, but perhaps this is why most folks put their raspberries in a separate garden. Here’s an excerpt from From Seed to Garden on raised bed gardening. Robert has been gardening using the raised bed method for several decades. I’ve come to appreciate its benefits as well. He rakes the soil into eight-inch mounds in three- to four-foot wide rows. He forms the raised bed from soil raked into a mound. The space left forms the paths between the raised beds and is an excellent place for mulch application. The mulch we place on the garden serves as its own compost bin. We use straw from a local farm—we buy six-eight bales total in summer and fall. They cost approximately $7 each. 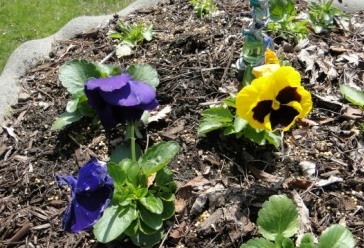 I use them as decorative items in the yard until Robert’s ready to pull them apart for use as mulch. We also use mushroom manure, grass clippings from our lawn, leaves from our trees, compost from the bin, plants that have bolted, remains of vegetables, such as cornhusks, pea pods, or bean ends and strings. 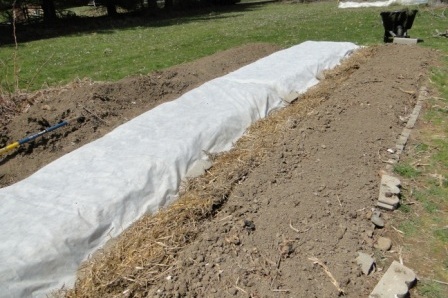 This material goes into the valleys between the raised beds to form a path between rows. It’s very easy to reach all the plants in our garden from the mulched paths. When we first married, I was cautious about going into Robert’s sanctuary because I didn’t want to do something wrong or step on anything. After the first year of working with him in the garden, I realized his way of laying out the garden made it extremely friendly for me to go out and pick vegetables. Also, with the heavy layers of mulch between the rows, there’s very little weeding to do in the garden. Raised bed gardening provides several benefits over regular garden beds. Because the plants are above the ground, drainage from the beds is very good. It also helps in aeration of the soil and the plant’s roots. It increases the depth of the bed. And my personal favorite, it provides excellent demarcation of the plants and the walking paths. Short little post today to remind us all, spring is here. I’ll keep reminding myself of that this week. I’m in shorts today, but the weather experts keep saying there’s a chance for snow later this week. In the meantime, I’m enjoying a little color in the yard. 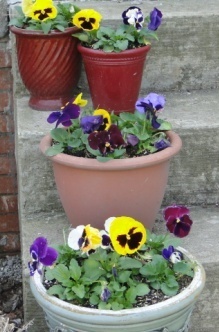 I planted pansies in an old bird water bath and in pots for the front steps a few weeks ago. So far they’ve survived a light frost. I don’t know how they’ll do in snow. 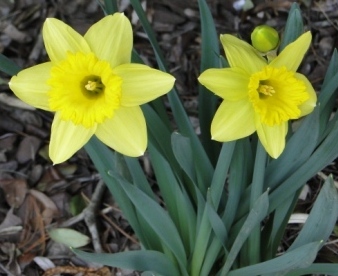 And the finally, I spied the daffodils in full bloom under the front bushes. Tulips have yet to burst out, but hopefully they won’t be long behind. What’s going on in your yard? I’ve written about the mallard ducks in our neighborhood in previous years. They come in March. Three males hang out for a bit with a female until the female goes to her nest either out by the mailbox or under our deck. These ducks have been inbreeding for years. A creek is just down the hill in the our backyard yet they stay in the neighborhood, mainly at the farm where they originated. I’m guessing that years ago someone bought a couple of cute ducklings for Easter presents. Now those ducks number in the dozens and really have forgotten that ducks belong near water. When it rains they play in the mud puddles at the farm. A few go in the tiny puddle while the others wait on the sidelines patiently. We don’t have mud puddles. However, this year when my husband lay plastic on the raised beds so the soil wouldn’t get too wet, the dips in the plastic formed places for water to collect. Yep, we now have a duck pool. Almost four years after Deepwater Horizon caught on fire and opened up the well that gushed millions of gallons of oil in the Gulf of Mexico, some of the long term effects are being felt. BP’s oil spill may be with us for many decades to come. Let us not forget the lessons learned. Safety standards must be followed and enforced. In 2013, I published the novel Trails in the Sand, which begins on April 20, 2010, the day of the BP oil spill. 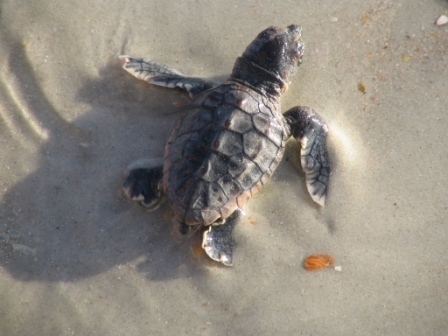 The novel chronicles the race to save sea turtle hatchlings as the oil approaches Florida’s beaches and lands in the sea grasses that serve as home to the infants for months before they venture further into the sea. I ended the environmental part of the novel with hope that perhaps the barrels of oil dumped into the Gulf of Mexico dispersed enough to save wildlife. It’s disheartening to read what I probably have known all along in my heart. To celebrate Earth Day 2014, which ironically shares the same anniversary date with the BP oil spill, Trails in the Sand is only .99 cents for the #Kindle version during the month of April. I hope you enjoy reading this novel of love and redemption. Click on the cover below to go to the Amazon purchase page.